Blackets Map of 1871 – continuing places of interest. A further look at Steen & Blackets Map of 1871. Throwing a little light on – No.5, “The Star Vaults”, No.6, Mount Zion, Methodist New Connection, and No.7, Albion Wharf. No.7 on the map is Albion Wharf. Over which part of this Wharfage, James Bradshaw built his flour mill, in 1828-29. In Alfred Hinde’s directory of 1932-33 , Fellows Morton & Clayton, are noted as the main canal carriers operating from Albion Wharf, and what I find interesting is that their agent at that time is W.S. Bradshaw. Bradshaw Street to Shipton Street. 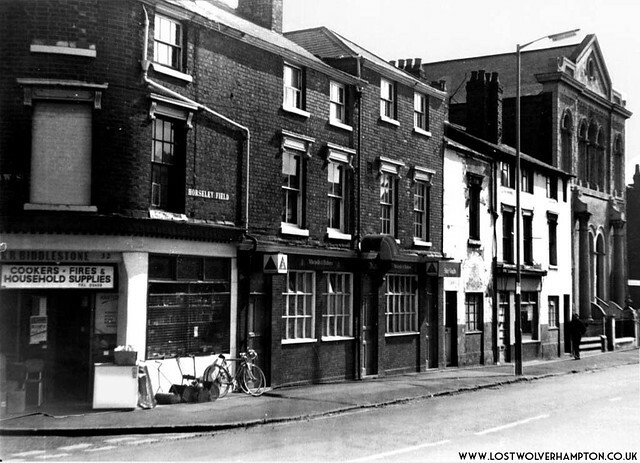 This is another late 1960’s panorama of shops and businesses on the north side of Horseley fields this section lay between Bradshaw Street and Shipton Street. On the corner of Bradshaw Street we see the former Star Furnishing Stores second hand furniture dealers, the owner of which at the time of its demise was Mr Biddlestone , a name that may conjure up memories for some. At the time of the above picture my brother in law who had recently married was renting the flat over the shop, he later emigrated to Australia, not though before telling me of the strikingly good looking young lady who worked behind the counter of Teecey’s butchers two doors away. In between the secondhand shop and the butchers, stood No. 5 on the map; “The Star Vaults” a William Butlers house which I recall at that time was a bit of a starter pub for would be, Butler’s tenants. It was though, at this time, to prove a safe haven and a fresh Start for my Aunt and Uncle Tommy and Francis Challoner, Butlers tenants, who overnight lost all their belongings and their initial house, “The Bridge Inn” Ettingshall Road in a Fire. There was no one there to catch this falling Star. 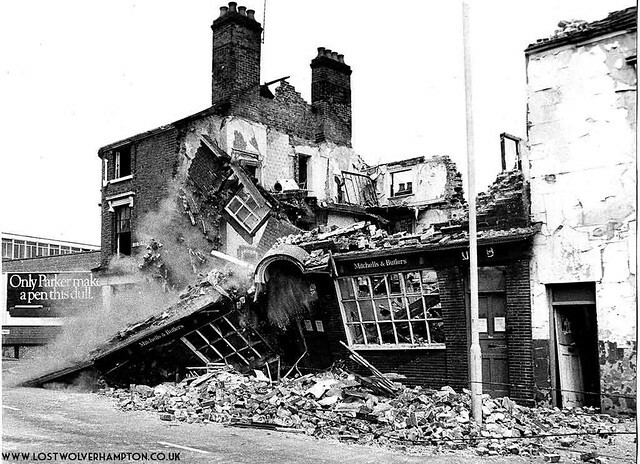 By the time the of the demise of the little block in the 1970’s and “The Star” that had shone in one shape or another for over a century, literally fell to earth, my Aunt and Uncle had moved on from Horseley Fields, to the Coach & Horses in Dudley. Mount Zion Methodist New Connection Horseley Fields late 1960’s. 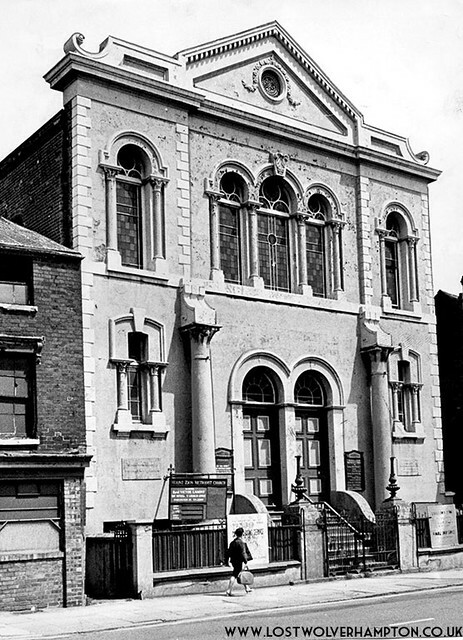 In Joseph Smarts Directory from 1827, it states; The Congregationalists, The Baptists and the members of The Methodist New Connection also have places of Worship in Wolverhampton and each chapel has a Sunday School. I believe the first meeting house of the Methodist new Connection,was in Short Street on a site where the Lighthouse formerly Chubb’s building stands today. 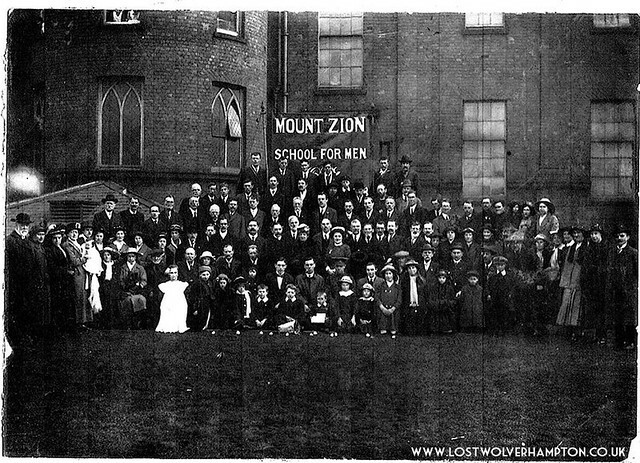 Then Later on the 16th July, 1867 This new building known as Mount Zion was opened for service.the site was Horseley Fields. In April 1881, under the leadership of Mr Price Lewis a staunch advocate of the temperance movement and President of the Wolverhampton Peace Society, an adult school for men was commenced on a Sunday morning. here discussions and instructions on differing subjects took place . at the end of the first year there were 140 scholars and 8 teachers. At this school commenced the scheme for collecting eggs at Easter for hospitals. this idea grew to such an extent that by the early 1930’s somewhere in the region of 20,000 eggs had been collected. Minutes from the meetings state: Eggs were received by Mayor Alderman Wood from Mr Price Lewis.Hospital Matron: Miss Miller. Minister: Reverend Davis Jack. Pictured I believe at the Royal Hospital circa 1910. The photo shows the presentation of “Easter Eggs” probably at the old Royal Hospital Cleveland Road Wolverhampton. “Standing immediately next to the banner, left of picture is my grandfather Jack Washington.born 1890. He learned to read and write at the Sunday school and also ’took the pledge’, giving up alcohol. 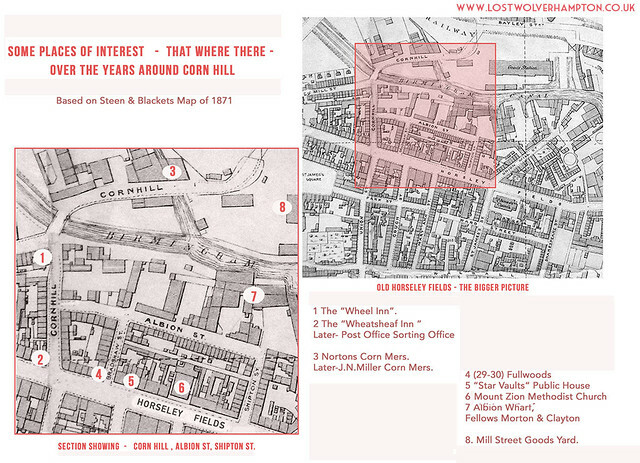 He lived ‘round the corner on Corn Hill”. Above and below are brief extracts as told to me by Sue (a friend of Margaret Philpot) from memories of her aunt Mary, Jacks daughter; probably one of the children on the photo. “On Easter Sunday we all used to take eggs to chapel (Mount Zion, Horseley Field, Wolverhampton.) and place them on a donkey cart. A parade then would start from from the chapel steps, with the Salvation Army Band leading all the congregation ,we then marched through the streets to the Royal Hospital where the Matron, Doctors Nurses and patients met us, In the reception hall inside we sang hymns and said prayers for the sick, and left eggs and gifts for the patients”. 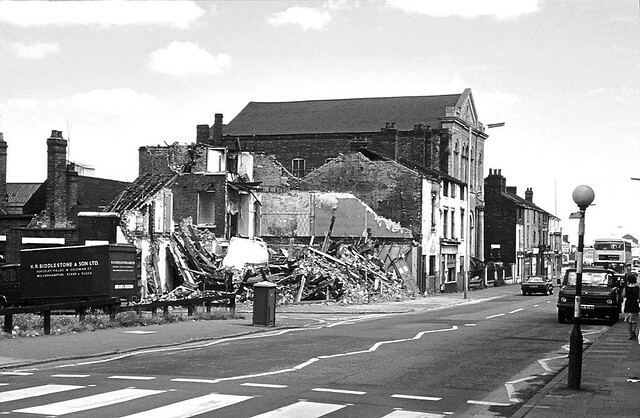 Bradshaw street to Shipton Street,a scene of destruction early 1970’s Picture courtesy of David Clare. The last hymn to the fallen had been heard from the Mount Zion in Horsely fields in 1968 but it remained in use by another faith until late 1970’s. Its hard to believe but with the demise of Mount Zion, which for a short while between 1968 and 1977 was being used as the Shri Guru Ravidas Temple, the town had lost three wonderful church buildings of different faiths in the space of a little over twenty years in Horsely Fields.